. The benefits of physical activity for children include better motor skills, improved physical and mental health and lower obesity risk. Moreover, sedentary behaviour is thought to have a negative impact on health. Behaviours formed in childhood and adolescence have the potential to influence adult behaviours and health, and early intervention should therefore be considered. Current guidelines for children aged 5-18 years recommend 60 minutes of physical activity on each day of the week, as well as reducing time spent sitting. However, the Health Survey for England 2010 reports that only around a third of boys and a quarter of girls were meeting this guideline. This research programme is examining the factors that influence young people’s physical activity, and developing and evaluating interventions that can be targeted at the population level. The overall goal of this programme is to develop and evaluate population-level interventions aimed at this behaviour based on a thorough understanding of the patterns, correlates and determinants of young people’s activity-related behaviour. Our efforts focus on quantitative analyses of patterns of and factors influencing change in physical activity in different age groups and across different transitions throughout childhood (e.g. from preschool into primary school and from primary into secondary school). This programme is also studying associations between physical activity behaviours and non-physical health outcomes (e.g. psychological health and academic performance). The study of characteristics of physical activity and how it changes is crucial to understanding when and where interventions may be targeted and what specific behaviours should be considered. In order to facilitate this, we are studying what behaviours are most important to overall levels of physical activity and sedentary behaviour, as well as time-based differences in physical activity (change). The study of influence on young people’s physical activity behaviour is limited by the cross-sectional nature of most data presented. This makes it impossible to start understanding the cause-and-effect relationship between variables. In this programme, we aim to study the predictors of behaviour change in children and adolescents. Using data from in children from different ages ( SWS, SPEEDY, ROOTS), we are establishing the key influences on behaviour change to be targeted in interventions. 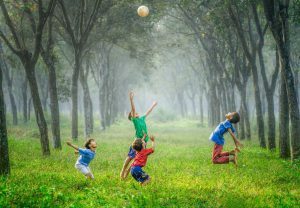 Research on preschoolers’ physical activity is relatively scarce, particularly in the UK, and most studies have limitations in the physical activity data and exposure variables collected. We have therefore assessed objectively measured activity in and outside the preschool setting, and combine it with observations of the preschool environment to establish influences on physical activity. This will allow us to develop and evaluate an appropriately tailored physical activity promotion intervention in the future. Sedentary behaviour such as TV viewing is an important health behaviour. Although associations with health are less clear in young people than in adults, they spend large amounts being sedentary. We are focusing on studying patterns and influences on changes in sedentary time and specific sedentary behaviours, as well as exploring what drives the socioeconomic patterning of specific sedentary behaviours, such as TV viewing. This will aid the understanding of how interventions to reduce sedentary behaviours may be targeted. Results from our observational studies inform the development of interventional studies. For example, in the SPEEDY study we showed the importance of family and home environmental factors for children’s physical activity but intervention evidence is inconclusive. We are therefore developing and evaluating an intervention aimed at promoting parental awareness of child physical activity and family activity levels using self-monitoring, action planning and goal setting strategies targeted at the family (FRESH). Using evidence synthesis and focus groups we will refine the intervention and study protocol and subsequently conduct a pilot evaluation including objectively assessing physical activity in the children and their main carers before embarking on a full trial. Physical activity promotion is relatively understudied in adolescent populations. Our GoActive and CASE studies focus on promoting physical activity through secondary schools. Following an extensive programme of work focussed on observational analyses, evidence synthesis, intervention development and preliminary testing, a full-scale evaluation of the GoActive programme starts in 2016.